The ability to draw upon and utilize transferrable skills is clearly important. Specialist training can in part at least help harness and enhance the existing skill set that may enable the post holder to function more effectively. Knowing when to speak and when to remain silent is a life skill. Listening is a pre-requisite as is the ability to look as well as see. Law-Makers are invariably part of a collegiate decision making process and this demands patience, the ability to fight one’s corner (particularly with regard to ministerial staff and funding) as well as being prepared to compromise. Junior ministers have to be quick learners, and be prepared to accept that many governments function on the understanding that they operate along the lines of collective responsibility. It usually takes a while to realize that dissent does not necessarily mean or imply disloyalty, and this is equally true of ministerial staff as it is of ministers themselves. In Westminster style democracies responsibility takes two forms, that of collective and individual responsibility. Effective government requires those that exercise power to pay equal attention to the exercise of responsibility, something that takes discernment and fine judgment. Secretaries of State and Ministers are expected to grow in experience and exercise judgment that demonstrates understanding and sagacity. Very rarely do our politicians live up to society’s expectations. Any form of induction or on the job training must also a tune itself to the shifting societal standards. Governments and political parties are forever chasing success, but as we all know there are varying degrees of success. Success in our personal lives, in business and in public service assumes that we have some understanding of the factors that might help us to optimize success. 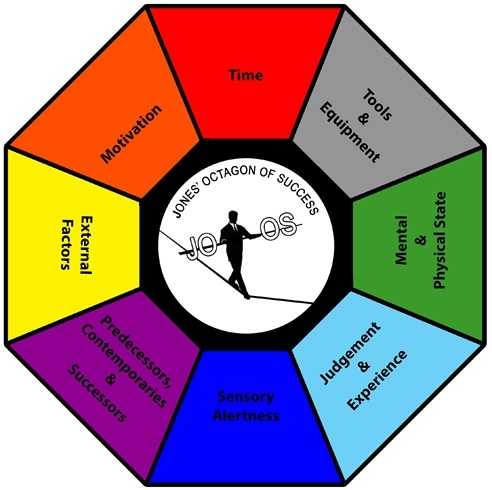 Jones’ Octagon of Success (JOOS) enables an appreciation of eight elements that generally come into play. Most Legislators (and for that matter the rest of us) will often place greater emphasis on two or three elements, but in reality need to ensure that all eight areas are absorbed, understood and acted upon. JOOS is such that it can be applied to most roles that said it becomes ever more pertinent the higher a person rises within an organization. Even the most experienced and seemingly sure footed of ministers are indiscrete, make gaffs in front of the press or at the end of the long day at the office verbally lash out at a member of the public or in the recent case of a senior British Politician at a Police Officer on duty at the gates of No 10 Downing Street. All ministers whether new to the post or of considerable experience are pray to lobbying and the machinations of vested interests. It is difficult to escape those carefully choreographed visits to schools, factories and farms designed to show the Minister what it is thought they want to see. In is not necessarily a matter of ministers working harder, but working smarter. Objectivity, pragmatism and the ability to ask searching questions are essential requirements of ministers who aspire to be office holders that bring about a positive change. Positive change relies to a large degree on the issue of trust, often a rare commodity in political circles, but a prerequisite of real transparency. Transparency requires that ministerial dealings are open and objective, something that is easier said than done. In reality there are times when robust legislation finds itself diluted into mere recommendation, and regulatory bodies are emasculated or rendered ineffective. When the Ministry of the Environment and Forests, Bangladesh endeavored to address the environmental degradation brought about by it being one of three countries that according to the World Bankaccount for 70-80% of the global ship breaking and recycling industry (SBRI) representatives from the ship breakers successfully lobbied their way onto the committee designed to tackle the problem. With ship breaking a major industry in the environs of the Port City of Chittagong, as well as a key employer, it did not take the representatives of the industry too long to scupper most of the safeguards that were being proposed for the sector. The ministerial high wire act is one that requires remarkable perspicacity and courage. Indian legislators could learn much from some of the shining lights from the world of business and the media. There are plenty of inspirational individuals who have managed to demonstrated single-mindedness and determination without appearing to sell their soul to get where they are today. Kunal Bahl (CEO of Snapdeal), Shubhra Chadda (Co-Founder of Chumbak) along with the likes of Chetan Bhagat (author and columnist) and Shantanu Bhagwat (author and publisher of satyameva-jayate.org one of India’s foremost blogs) exemplify much of the promise and positivity of the sub-continent. Success rarely comes easily and for those in New Delhi and other centers of Law-making and Administration it is imperative to draw lessons from all walks of life. Equally for those in their quest for power would do well to remember that they are elected or appointed to serve and so must be as ready to walk the corridors of responsibility just as these do the corridors of power.